It has been an amazing five-year journey, as of April 2010. My visits began following a call in summer 2019 by the Vincentian World Family (Vincent de Paul began justice ministry as a priest in France during the 17th century, working for the urban and rural poor and with the imprisoned). The call was to serve Haiti as the poorest country in the western hemisphere as a celebration of Vincent’s death 350 years prior. What took shape prior to my first visit was a plan to bring Focusing to a couple Haitian not-for-profits in the way William Hernandez of Ecuador had done with the foundation he heads. Following the January 2010 earthquake my work became an ongoing series of workshops with the neighborhood where I stayed and several organizations. At first, Focusing was part of a basket of “tools” for trauma response, both for those who were suffering from multiples losses and those needing care for themselves as care-givers. I stayed in a “mission house,” Matthew 25 House, which had been converted immediately after the earthquake to an emergency surgery; I ate at the table where there had been operations only three months before. I visited the tent camp that had grown in the soccer field next door; I heard stories and stories. The trauma workshops drew on my basket of tools—Focusing, meditative practices, theatre games, and movement exercises, as well as some of the CNVC material learned from Beatrice Blake, any of which could be followed by a reflective process using arts or in groups allowing expression what came inside. 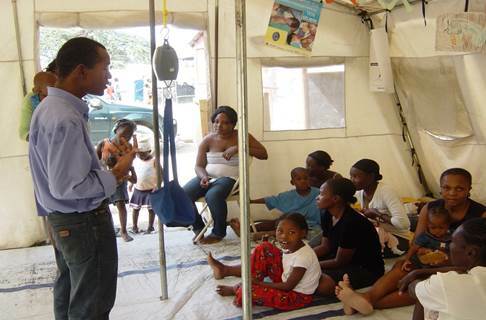 Concern Worldwide invited me to give workshops for a group of lay counsellors assigned to “baby tents” for mothers of young children in the earthquake tent camps. I then started a series of trainings with a group of neighborhood conflict intervention trainees. Following Concern Worldwide’s shift from these projects, I began working with Renate Schneider in Jeremie in September 2013 and February 2014, teaching her group of Haitians who use community mental health training in different locations—community clinics, a congregation, or with neighbors (her organization is Haitian Connection --haitianconnection.org). 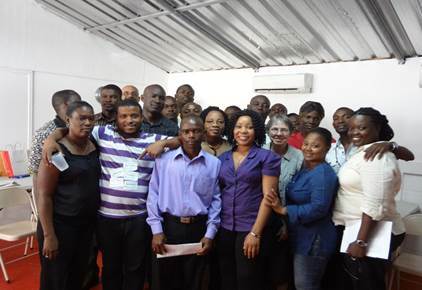 I have also begun work with a Haitian-founded antiviolence organization, Lakou Lape (Place of Peace), with one training for resilience and community building in February 2014 and another training in Wholebody Focusing in March 2015, which Renate also attended in order to bring the material back to Jeremie. I am able to offer these workshops without a fee, because funding for my work comes from DePaul University, first their Mission and Values Office and currently my funds as a member of the Society for Vincent de Paul Professors. Eventually people working permanently in Haiti, like Renate, or the Haitians we are training in Focusing, Community Wellness Focusing, Wholebody Focusing and Heartfelt Connection & Conversation, and Complex Trauma Focusing will become trainers. This fund is intended for those living and working in Haiti who have begun or Focusing training to attend further training only available in the United States, such as the Certification Weeklong. 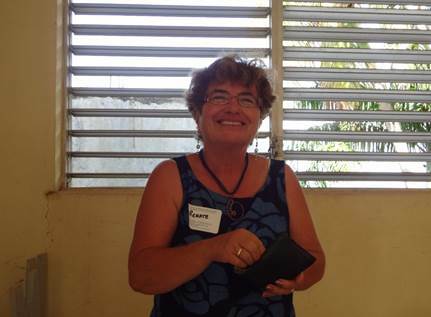 Renate Schneider, of Haitian Connection, will attend FISS 2015, with the help of funding from the TFI Haiti Func. Please click here to contribute to the Haiti Fund. This fund allows people who live and work in Haiti and have begun Focusing training to attend further training only available in the United States, such as the Certification Weeklong.